A once overlooked corner of the deep South, Greenville has evolved into a place to see and be seen while holding onto its small town vibe. The city’s picturesque setting at the foothills of the Blue Ridge Mountains, between Atlanta and Charlotte, is a convenient jumping off point for other excursions (many worthy destinations are only a short drive). The beautiful pedestrian friendly downtown area is the focal point for any traveler. Climate: Comfortable. Four seasons are distinct, but weather extremes are rare. Business: Michelin, Lockheed Martin, General Electric and Fluor are major economic players in the area. BMW’s North American manufacturing facility, located just miles away, has fostered sustained growth in the automotive industry. How to Get there: Major interstates make accessing Greenville quite simple. I-85 runs directly through the city, connecting Charlotte and Atlanta. By air, Greenville-Spartanburg International Airport is convenient, but flying into a larger airport is usually cheaper. Westin Poinsett – In the heart of downtown, this is the city’s flagship hotel. A regular spot for weddings and other events,you can’t beat the amenities or location. Rooms start at around $130 per night. Check out the pictures, or book a room here. Hyatt Regency – Also in downtown, starting at around $160 per night. Read about the amenities. Take a virtual tour, or book a room here. Pettigru Place – Voted Greenville’s best bed and breakfast. This cozy old inn in the heart of the Pettigru historic district provides unique accommodations and delicious breakfast each morning. There are only six rooms, so book in advance–around $150 per night. Book here. Crowne Plaza – A little farther from the downtown area, the Crowne Plaza offers nice, clean accomodations at a reasonable rate, starting at $140 per night. Read about the amenities or book a room. Greenville Hilton – Also a little outside of the downtown area, the Hilton is close to shopping in dining in the Haywood Road area. Right off of the interstate, it’s a good stop if you want to do a little further exploration. Rooms start at $130 per night. Take a virtual tour or book a room. Artisphere – Voted in the top 20 events in the Southeast, this outdoor art exhibition festival is like no other. Occurs one weekend in early May, so plan accordingly. Tickets are reasonably priced, and unique artwork is available for purchase at any of the booths throughout downtown. Bi-Lo Center Events – At Greenville’s major event venue, concerts, sporting events, and family shows are usually a safe bet for a fun time. Check out what’s coming to town. Downtown Alive – During weekends from March through August, downtown Greenville transforms into an outdoor showcase for local musical artists. Read about the scheduled artists. Greenville Drive – Are you a Red Sox fan? How about a pure baseball fan? If so, spring evenings at Fluor Field in the West End is your ticket. The Drive is Boston’s single A team, and they play at a miniature Fenway! Take the downtown trolley to the field for the full experience. BMW Zentrum/Factory Tour – With BMW’s only North American manufacturing facility only miles away in Greer, a factory tour is definitely worth the trip. Tours run regularly during weekdays and cost only $7 ($3.50 for students). Falls Park – On a nice day, a stroll in Falls Park across the Liberty Bridge can give you the full Greenville perspective. 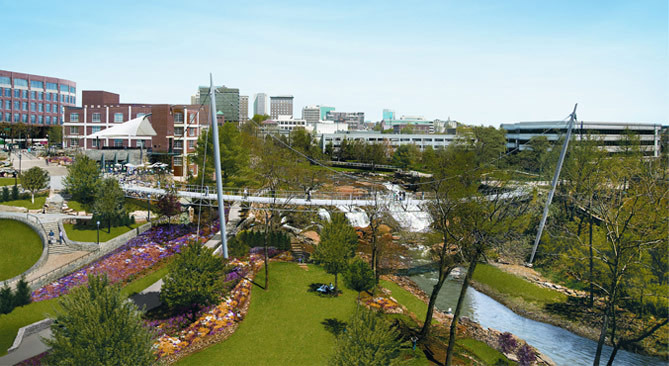 Magnificent gardens and views of the Reedy River provide the perfect setting for relaxation. Wild Wing Cafe – Nights at the Wing are good for travelers looking for tasty food and good times. After trying out the Bravehearts (or maybe something a little tamer) head upstairs for the real party–drinks, live music and a fun crowd. Barley’s Taproom & Pizzeria – Downtown’s premiere pool/pizza/beer joint. Quality, cheap menu and the chance to try more beers than you can count. The Lazy Goat – Upscale Mediterranean fare in the middle of downtown Greenville. Centered around community dining and a relaxed, “time well wasted” atmosphere, this is the perfect chance broaden your culinary horizons. Stax’s Original – Stax’s is a Greenville institution. Owned by the Stathakis family, this is a great down-home grub spot. Although it’s not downtown, take the short drive one morning for a real local experience. High Cotton – For some true Southern cuisine, High Cotton looks past the deep-fried stereotype. Lowcountry favorites are prepared with an elegant flair. Reservations are needed, but it’s always a hit with out of towners and locals alike. These are my high points, but I’m interested to here what others have to say. Comments and suggestions for other Greenville offerings are definitely encouraged! This entry was posted in south carolina and tagged carolinas, greenville, south, south carolina, travel, united states. Bookmark the permalink. Enter your email address to subscribe to Trekology and receive notifications of new posts by email.